The graphic below is part of my ongoing effort not only to maintain a list of all the volatility-based exchange-traded products, but present them in a manner which helps to highlight the distinctions among these products. As the chart below shows, VIXY enters the already-crowded space of VIX-based ETPs targeting VIX futures with one month maturity, while VIXM is aimed at the five month maturity space. ProShares undoubtedly hopes that by differentiating its products as ETFs rather than ETNs, the absence of credit risk associated with ETNs will resonate with investors. I have highlighted this distinction by using black italics for the ticker symbol of both ETFs. ProShares has also been fortunate in that as of this week options are now being offered on VIXY and VIXM, making these only the third and fourth optionable volatility-based ETPs, following in the footsteps of VXX and VXZ. Note that all four optionable ETPs have a red O preceding their ticker. 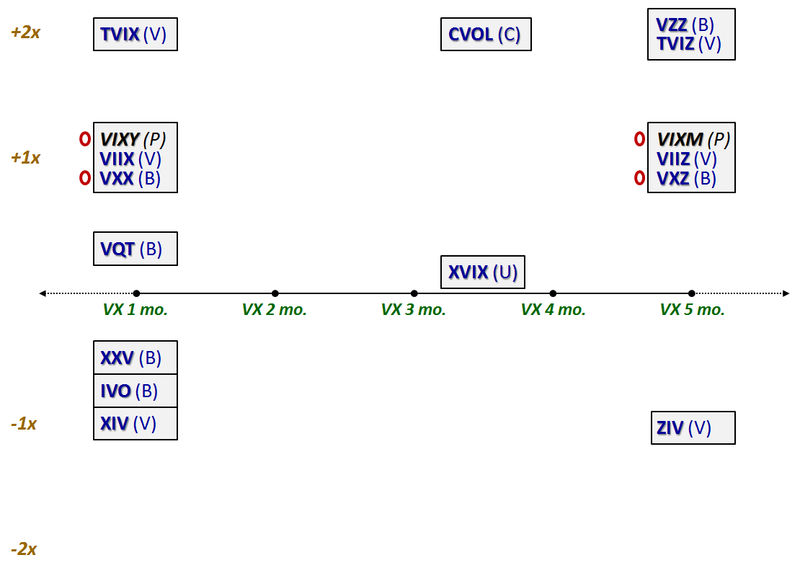 There are several other small changes in this chart, including moving XVIX closer to the neutral volatility line to reflect the fact that on average the long and short volatility components of this ETN net out to a very limited exposure to volatility and more direct exposure to the VIX futures term structure. With sixteen volatility-based ETPs available for trading and options on four of those, it is not an exaggeration to say that the number of possible volatility strategies and trades is limited only by the imagination.